ST. GEORGE — Three people were injured after a rental truck transporting business-related items and equipment rolled on Interstate 15 in St. George, blocking all travel and emergency lanes for two hours early Sunday morning. 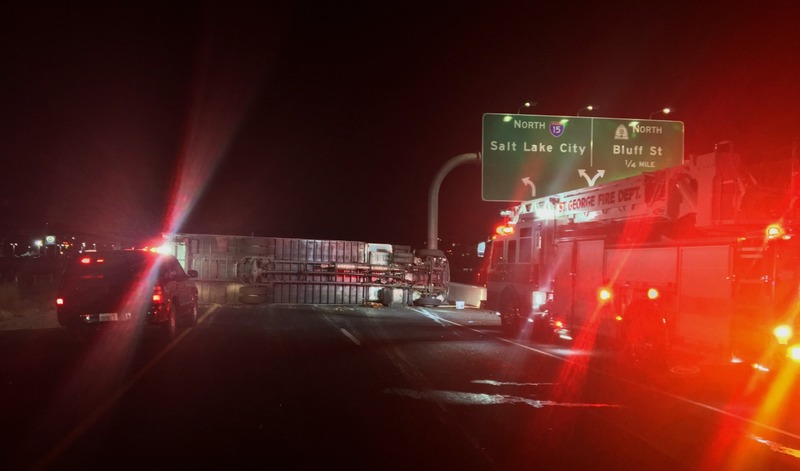 Shortly after 2:30 a.m. officers and emergency responders were dispatched to a single-vehicle rollover on Interstate 15 northbound near Exit 6 involving a large rental moving truck, Utah Highway Patrol Sgt. Jake Hicks said. Upon arrival troopers found the truck overturned with the driver’s side against the pavement and three of the vehicle’s occupants already out of the truck, along with a dog that appeared to be uninjured in the crash. All three occupants suffered minor injuries, two of which were transported to Dixie Regional Medical Center for evaluation and treatment. The driver refused transport and stayed behind. The driver told troopers that he was heading north on the interstate when he got on the Exit 6 collector ramp by mistake. Instead of continuing on through, the driver swerved hard to the left, Hicks said, and lost control of the truck as it crossed over the double lines of the off-ramp. Trying to regain control, the driver then overcorrected to the right, which sent the truck spinning clockwise until it rolled onto its side with the driver’s side down. The truck continued sliding for more than 100 feet until it came to rest blocking both northbound lanes and the two emergency lanes. The driver and his two occupants were moving a business from California to Salt Lake City and were transporting business-related items in the truck when the crash occurred. All northbound lanes in the area were shut down until the crash investigation was complete and debris was cleared from the roadway. “Luckily you have that collector ramp right there, so traffic was just diverted off of the interstate right at Exit 5 and then that ramp reconnects to Exit 6 where motorists could just get back on I-15 there,” the trooper said. The driver of the moving truck was unaware that the off-ramp reconnects to the interstate a mile or so down the road, Hicks said, noting that he could have continued on the off-ramp instead of trying to merge back on I-15, which invariably led to the rollover. All northbound lanes were reopened to traffic by 4:30 a.m. after the truck was pulled upright and towed from the roadway. Emergency personnel from Utah Highway Patrol, Washington County Sheriff’s Office, St. George Police Department, Utah Department of Transportation’s Incident Management Team and Gold Cross Ambulance responded and tended to the scene.